Welcome to another copy cat post! Yes, I'm not 100% original lately. I've been busy writing my thesis for school, so the whole being creative and designing my own manicures has escaped me, for now. 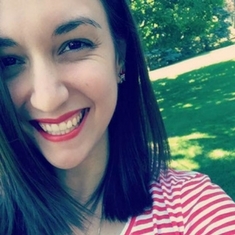 Good news is that my first draft was due last week and now I am working on edits. Still a bit more to do, but it's not as bad as creating the whole thing from the ground up. During the time I was drafting the project, I was still painting my nails and saving up posts. This manicure was inspired by a post I saw at PolishPedia. 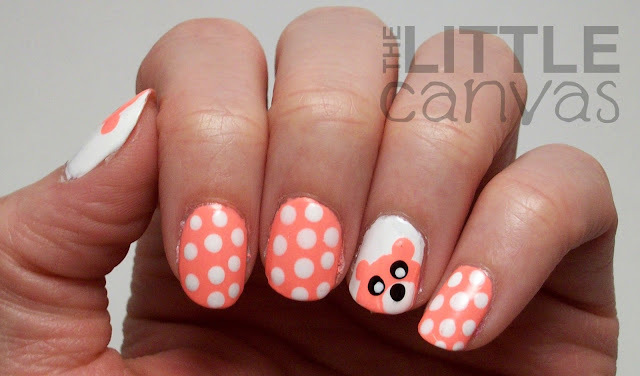 It was a manicure of cute little teddy bears. Since I had the same colors as was used in the tutorial, I thought I would attempt it with a little twist. Overall, I'm very pleased with how it turned out....just not with how the pictures came out. Seriously Flip Flop Fantasy is impossible to photograph! Let's take a look! My nails were rather long...kinda liking that length. Of course a day later one broke and they returned to nubbins. Also had to use the white lightbox background which turns grey.....ugh. I need to figure this stupid thing out once and for all....or shove more light into it. Adorable, right? In the PolishPedia tutorial, she had a white nail with pink polka dots. I really wasn't feeling it so I decided to do two teddy bear accent nails. I was going to do a middle and ring finger accent with the two bears looking at each other, but I decided against it since I have lately been disliking accents on those fingers. No offense to those who do that, but it's been bugging me when I personally do it. 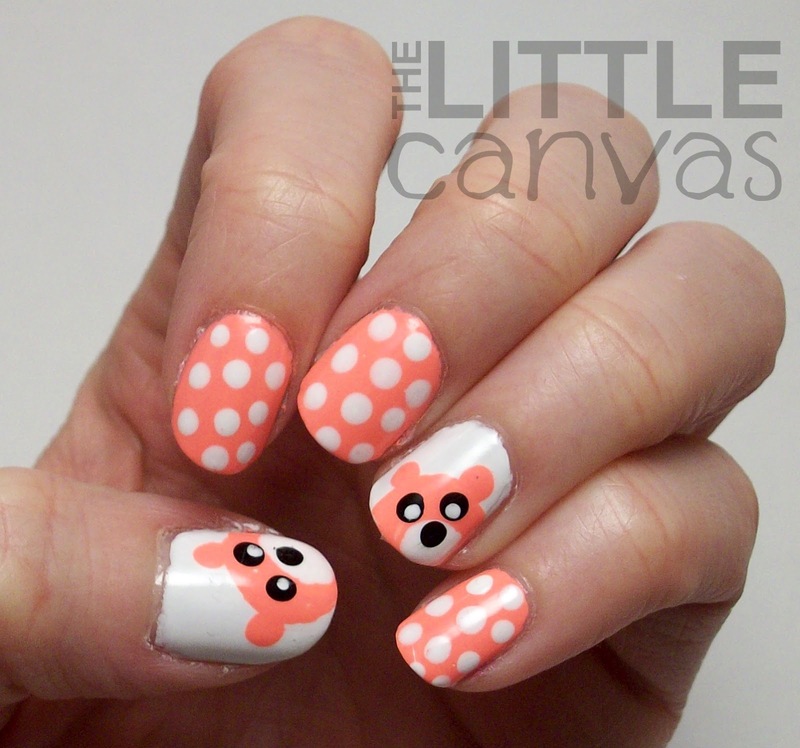 Besides, doing a bear face on the thumb gives you a bigger canvas and a cuter design. 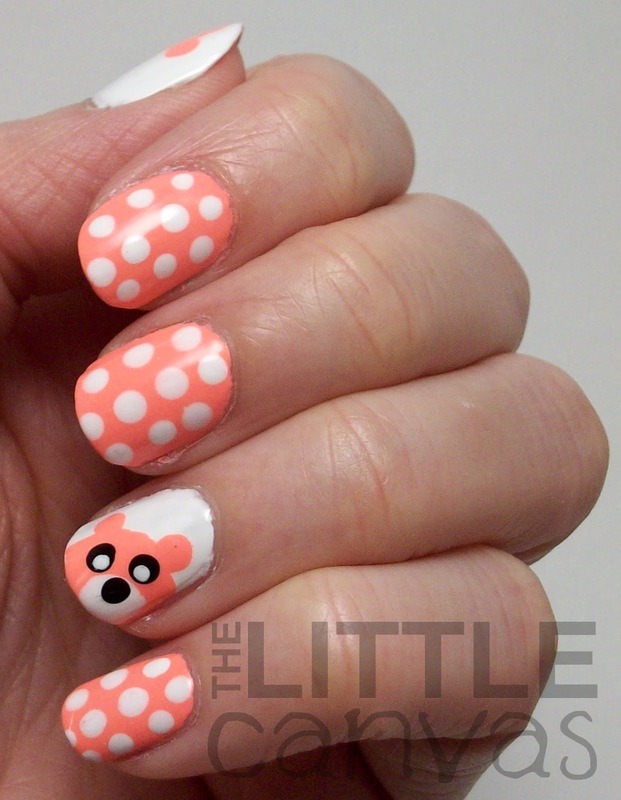 To design the teddy bears, I used a nail art brush and painted the large circle for the bears head. I filled in the inside of the bear's head using the same brush. When it was dried, I added ears, eyes, and the nose with different sized dotting tools. I cannot begin to tell you how proud I am of my polka dotted nails!!! Thanks to my new dotting tools from Born Pretty, I have more sizes which makes it easier to create the perfect dot. I was able to get them almost perfect!!! Also, instead of starting in the center and going down the middle of the nail, and then dotting along the side, I went diagonal this time. I think it worked out a lot better too because I again was able to cover more of the nail. If you want to get yourself some of these dotting tools, head on over to Born Pretty and use the coupon code AMBK31 to receive 10% off! Just click the little code on the side to go to their site! What do you think?? Love, hate? Are you able to photograph Flip Flop Fantasy perfectly or no? Overall, loved having this bright and cute manicure during the middle of a snow storm! It brightened my day so much!!!! thank you!!! they were so bright and cheery! LIKE! sweetest Teddy Bears ever! i love flip flop fantasy, it is my favorite nail polish ever. i think it only looks well in photos when taken under the direct sunlight..
Good to know for when I use it this summer!!!! Love your nails!!!! thank you for the example!! !